South Korean artists on Wednesday filed a petition with the Constitutional Court over allegations the ousted President Park Geun-hye's administration blacklisted cultural figures deemed critical of the government, a civic group said. 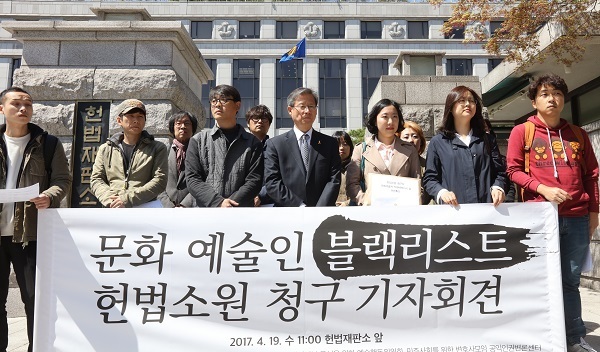 The People's Solidarity for Participatory Democracy said eight artists and cultural foundations filed the case against Park and her former aides, asking the court to rule on the constitutionality of such action. The former president was indicted Monday on a string of charges, including abuse of power and coercion for the alleged blacklisting from 2013 to 2016. Park's former chief of staff and ex-culture minister are also standing trial over their alleged involvement in the process. The civic group said the plaintiffs, who were all on the list, filed the case to confirm that such action goes against people's basic rights stipulated in the Constitution and to prevent similar cases from happening again.